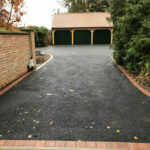 We were contacted by our customer to transform their old warn out driveway into something more modern for their needs. After a site visit and going through the options, it was clear that Resin Bound was the way to go. 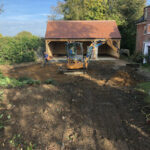 To start the project we got our team on site and started removing the old driveway. This was done with a mini digger to clear off the old tarmac. Once removed and cleared from site, this allowed our team to start laying the foundations for the new Resin Bound driveway. 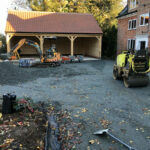 The main base of the foundation was a type one free draining system, this is key for the Resin Bound driveways; as this will need to allow water to drain through. When finished installing the type one draining system, this then gave the opportunity to lay the permeable Asphalt tarmac base. This will also allow water to drain through; creating a full draining surface. 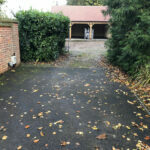 Another main benefit of using a permeable asphalt tarmac base, is that it provides a very strong and firm foundation for the Resin aggregate to be laid on. The final step was to lay Burnt Amber Chelsea set edging around the perimeter of the driveway area. 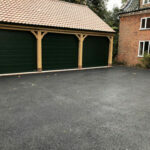 This was done to help frame the driveway and more importantly allow the Resin aggregate to bond to. To finish the job our customer chose to have a yellow and golden coloured aggregate for their surface. Based on this we then laid Dobbsweir Yellow Resin bound aggregate on top of the Asphalt tarmac base. If you would like to know more about our resin bound surfaces, then please make an enquiry through our email: [email protected] or give us a call on: 01508 470674.